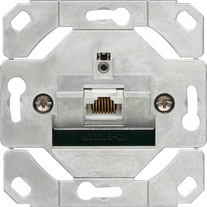 Shielded network connection box Cat.5e with a jack RJ45 (8) for data transfer rates up to 1 Gigabit Ethernet in accordance with IEEE 802.3an. 45° angled socket outlet for parapet duct, floor tank and flush-mounted installation. Cable entry possible from all directions in 8 x 45° increments.